WHISKAS ® Trio Crunchy Treats Seafood Flavours is rated 4.6 out of 5 by 106. Rated 4 out of 5 by Buttons35 from Nice Crunch Our cat enjoyed these in her dish, not so much to be fed as a treat. 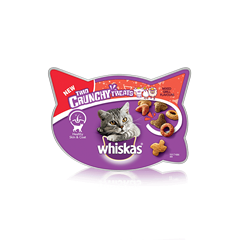 Rated 3 out of 5 by Floss from Good treats just my cat wasn’t fussed These look good and most cats eat them but my cat was go8ng through a fussy stage and wasn’t interested at all but my friends cat couldn’t get enough of them. Rated 5 out of 5 by 02harrisc from Tasty! Both of my cats love these treats and scoff them down without chewing half the time! Rated 5 out of 5 by kkbell from They loved them! The cats loved them, they're the main judges. I like the fact that the lid can be put back on to keep the treats fresh. Cereals, Derivatives Of Vegetable Origin, Meat And Animal Derivatives, Vegetable Protein Extracts, Oils And Fats, Minerals, Fish And Fish Derivatives (Including 1% Tuna, 1% Salmon), Molluscs And Crustaceans (Including 1% Shrimp), Yeasts. WHISKAS® Trio Crunchy Treats® with Salmon, Tuna & Shrimp are formulated to meet the nutritional levels established by the AAFCO Cat Food Nutrient Profiles for adult maintenance.